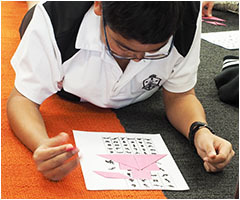 Mathematics is studied throughout years 7 - 10. 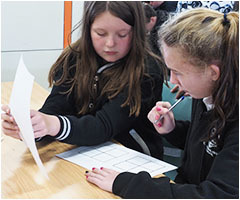 Level 1 - is for students who show a high level of mathematical ability and interest and may like to continue studying Mathematics at Secondary College or University. Level 2 - prepares students intending to study Mathematics for Institute of Technology and Secondary College courses, and for some University courses. Level 3 - is for students who intend to study in areas where Mathematics is a small part of a course at Secondary College or the Institute of Technology. Year 7 and 8 students follow a common course over the three levels. Students in Level 1 learn additional skills by doing extension activities. Level 3 classes are smaller and there is opportunity for remedial work and consolidation of basic concepts. Progress is closely monitored and students move between levels at regular intervals. Year 9 and 10 students follow a different course in each of the three levels. Students are assessed using tests, classwork, achievement standards tasks and homework.